American football is often seen as a violent sport. Charlie Camosy, a professor of Christian ethics at Fordham University in New York, called it “a great combination of raw caveman strength and gladiatorial combat and the most complicated chess match you can ever imagine.” This was part of a BBC interview in which he questions the ethics of football as a sport that glorifies violence. 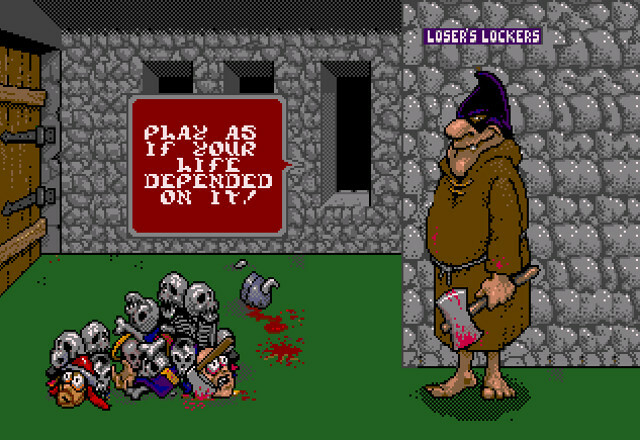 But long before professors (and columnists) began debating about the more violent aspect of the United States’ beloved sport, back in a golden age called the 1990s, a few game developers had the idea to simply turn that violence up to 11 and run with it. Thus Pigskin 621 A.D. was created. 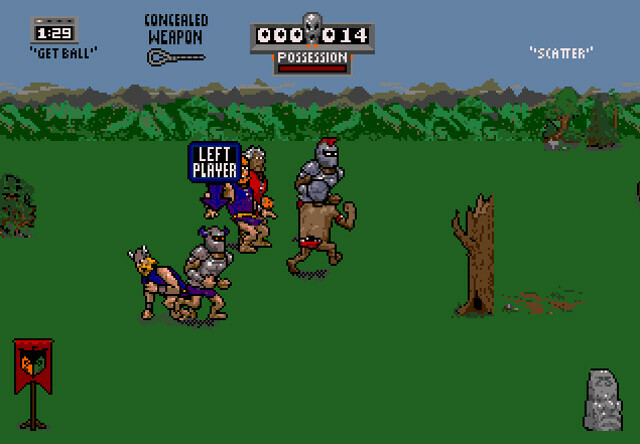 Released in 1990, this arcade classic pitted two teams of brutish Medieval warriors against one another in a game that resembled modern American football. 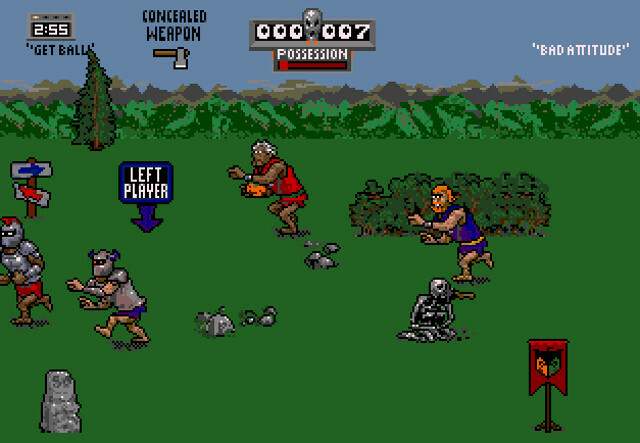 This game was ported to the Sega Genesis in 1992 (the exact launch date was December 18, 1992, which means it landed on the Genesis before Mutant Football League did). With the move to home consoles came a brand-new title: Jerry Glanville’s Pigskin Footbrawl. Personally, I’ve never had the opportunity to try the arcade original, but I have spent a great deal of time playing the Genesis version, so this is the version I’ll be focusing on for the remainder of this article. In Jerry Glanville’s Pigskin Footbrawl, two teams battle across a field littered with deadly obstacles while trying to get a ball into their designated end zone. That’s a simple enough goal, but Pigskin Footbrawl also allows players to punch each other, which often forces opponents to drop the ball, or, even better, creates a dust-cloud skirmish. Players can find weapons strewn across the field, which will be added to their inventory of “Concealed Weapons.” Simply possessing a weapon will give you the advantage in a skirmish, usually resulting in the brutal death of your opponent. Weapons include swords, spears, axes, maces, and nooses. At one point in time, Wikipedia claimed that the Genesis version removed the noose and the scythe (which were apparently present in the arcade version) but this is at least 50% incorrect. I have not yet seen the scythe, however. One of my favorite quirks about this game is that when one team scores too many goals in a row, the other is allowed to summon a troll, which is faster and tougher than normal players. Trolls are also distinctively green in color. I can’t overstate the advantage these trolls provide. 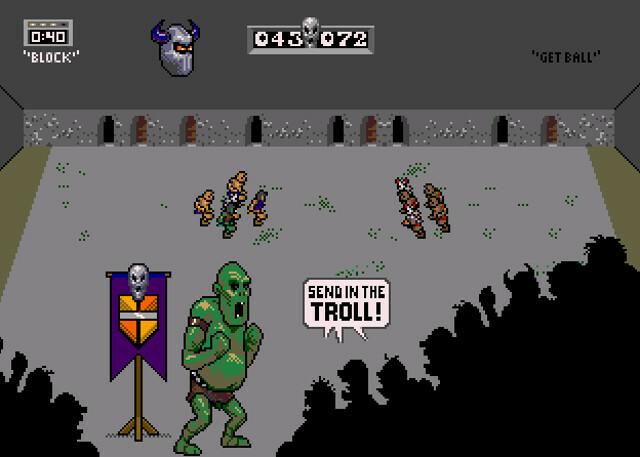 Typically, having a troll on your side results in your team scoring several goals in a row, allowing your opponent to also summon a troll. While this returns the odds to where they were when you started, it’s always entertaining to see two trolls battling it out on the field at the same time. 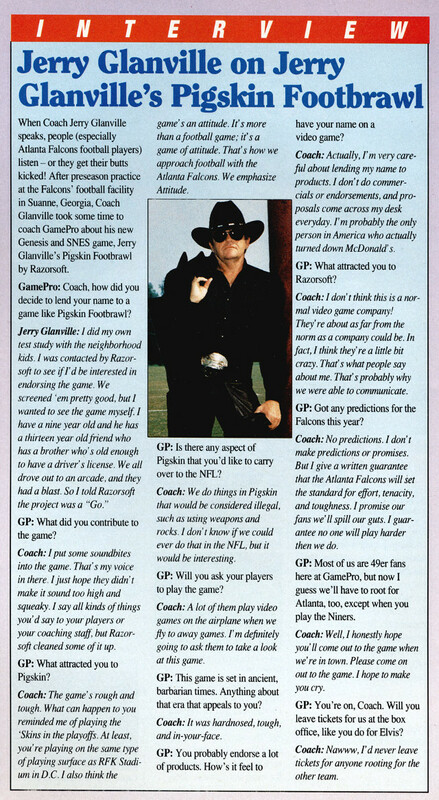 If you weren’t a big football fanatic in the early 1990s, you might be asking, “Who is Jerry Glanville, and why is his name in the title?” Well, during the Pigskin era, Glanville was the coach of the Atlanta Falcons, a position he held from 1990 to 1994. Actually, I’m very careful about lending my name to products. I don’t do commercials and endorsements, and proposals come across my desk everyday. I’m probably the only person in America who actually turned down McDonald’s. That makes Pigskin Footbrawl a rare piece of history indeed. I’m not sure why this particular video game received the elusive Glanville blessing when so many other products were deemed unworthy, but it did, and here we are. 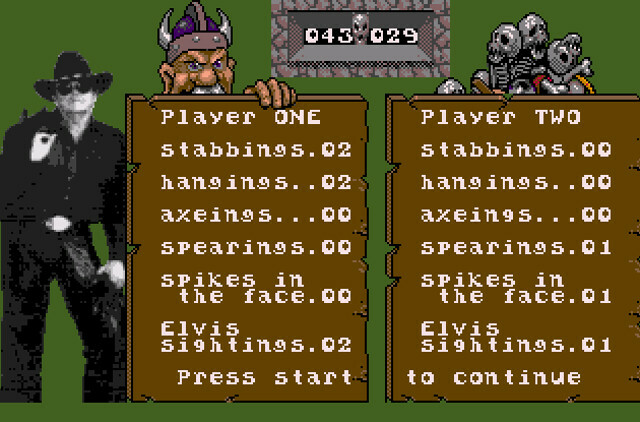 But Glanville’s name wasn’t the man’s only contribution to the Genesis game. There’s a picture of Glanville, dressed up in cowboy duds, in the halftime and post-game stats screen. It’s an odd choice, since the pixelated photograph looks completely out of place against the more cartoony aesthetic of the rest of the game, but it makes more sense if you’re familiar with 1990s design. This era was basically the Wild West of graphic design. I put some soundbites into the game. That’s my voice in there. I just hope they didn’t make it sound too high and squeaky. I say all kinds of things you’d say to your players or your coaching staff, but Razor-soft cleaned some of it up. Jerry Glanville’s Pigskin Footbrawl might not be all that important in the grand scheme of things. It’s certainly not considered a classic or fondly remembered by millions. But, at the very least, it seems to have won over the heart of a very elusive NFL coach. For reference, the full Glanville GamePro interview has been posted below.